I recently went through the books on my shelves in my office at school. There on the shelf, back behind a stack of assorted novels, was Invisible Man by Ralph Ellison. 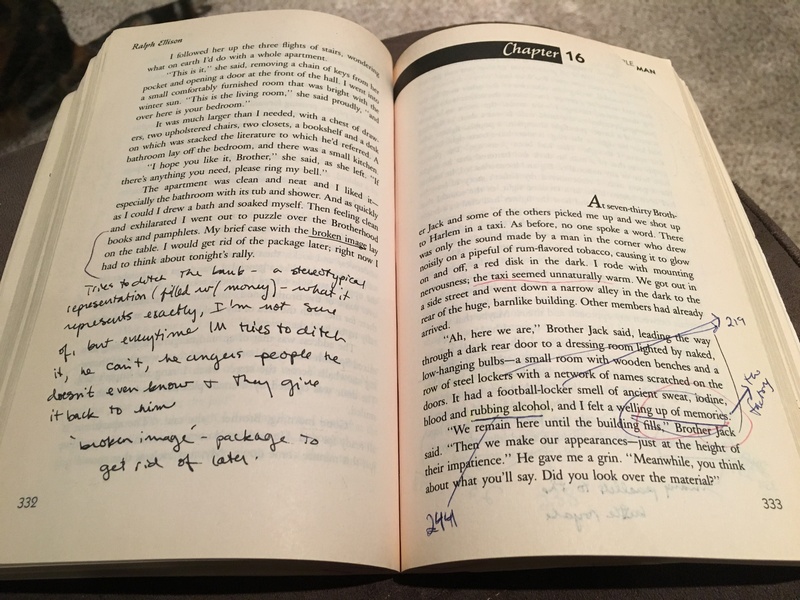 It was not just any copy of this book. 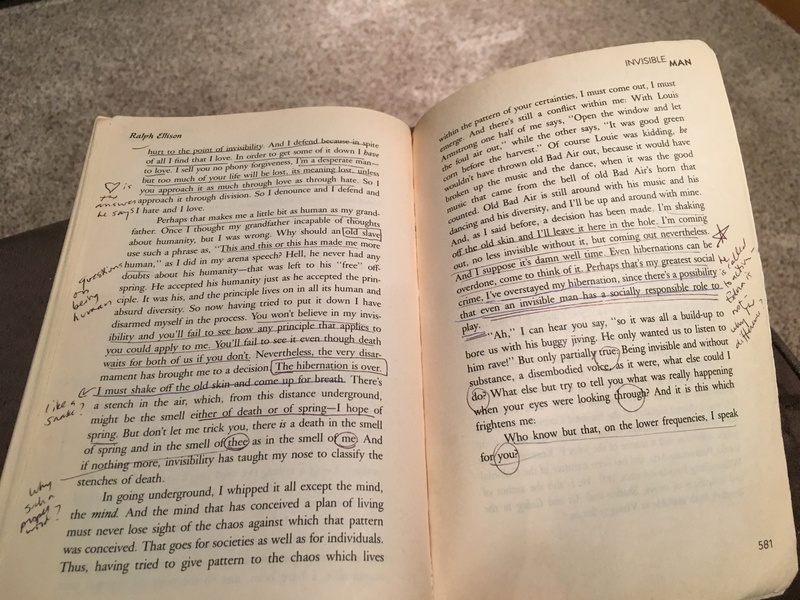 It was MY copy of the book–my copy from the African American Literature course I took in college in the spring of 1994, my copy that I took on my airplane with me when I flew to New York that spring break to visit my best childhood friend at Columbia University, my copy with margins full of my notations–evidence of the most engaged reading I had had with a text since many, many years earlier in my life. I read the prologue on the east bound airplane. 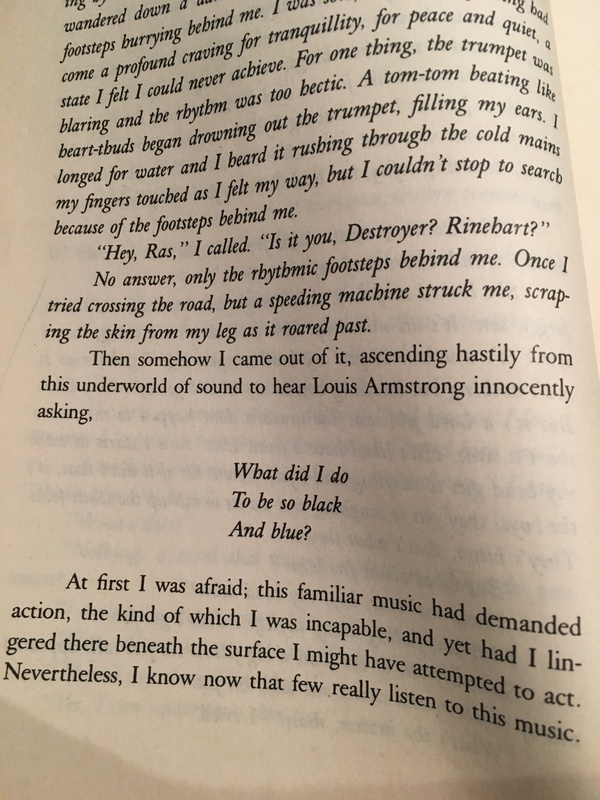 The narrator was high on reefer, he said. He was listening to Louis Armstrong sing about why he was so black and blue. 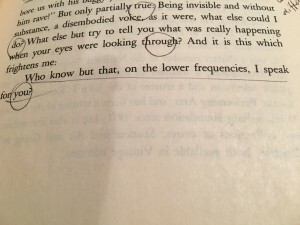 I read the words, and I actually heard the music–something I didn’t realize was even possible with words. I read, consumed, lingered over, considered, lived every single word in that book. 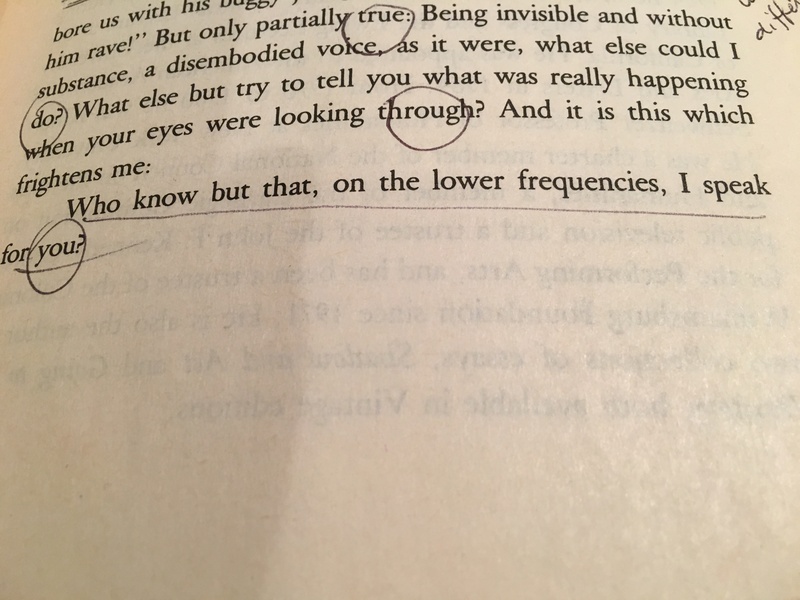 How was it possible that I was several semesters into my declared English major, yet this was the first book I had actually read in a meaningful way since I was a young child sitting on my front porch, reading until the twilight was strong enough I could no longer see the words on the page? I devoured books as a child. I still have many of MY books from then, tucked away on my daughter’s bookcase. It’s unlikely that she’ll read them, but I know they are there. They are evidence of my relationship with books, with characters and stories and far-away places and obstacles to overcome. I worked through the Choose Your Own Adventure books backward so I could figure out which choices to make to get to the endings I wanted. Despite this childhood love of books, I completely lost it by high school. I cannot pinpoint the moment in my memory when it happened. All I know is that by the time I walked into my AP Literature class as a 12th grader, my world was devoid of books. I looked at the list of the classics on the syllabus and promised myself I would read them. The first book was Gulliver’s Travels. My teacher told us it was pretty much the first novel ever. I of course knew some things about it–mostly tidbits from Gulliver’s travels in Lilliput–huge visitor strapped down to the ground by tiny Lilliputians. And this was where it all came from? I was curious. I started reading. Teacher walks over to my desk, hulking over me, looking down as I cowered behind my book. Teacher turns from me and walks away. Full disclosure: It was not possible for my AP Lit teacher to hulk over anything–she was the kindest, sweetest, most lovely person. The hulking (and my cowering) are how the memory lives in my mind, both physical manifestations of the way I was feeling in that moment. But the words, the conversation–I’m pretty sure that’s how it happened. And I see the ways I may have been a bit of a butthead in the situation. Looks like I maybe interrupted her a few times there. And maybe my friends and I were somewhat rambunctious that day. It happened on occasion–behavior that warranted the teacher to enter our general proximity to redirect our energy. In my memory I was the perfect student in that moment, trying to participate earnestly in class, with my hands clasped before me on my desk, perfectly polite, but I know that was likely not the case. But I do know that after that moment, I did not read more of Gulliver’s Travels. Nor did I read any other book on the syllabus that year. I tried each one, but I just didn’t make it. The books remain on my too-long list of books yet unread, these on a special section of the list reserved for my guilt and regret for not reading them in that class when I had the opportunity. After that short interaction with my teacher, the promise I made to myself didn’t matter. The class that initially engaged me as a reader became school as usual, yet another place where the teacher controlled what we read and what we were supposed to think about it. I reverted back into passive student role, listening carefully to the teacher’s interpretation and returning that to her on exams and in essays. I attended every single one of her review sessions, but I didn’t read a single book in that class. I got a B in the class (which was okay in my mind; due to the weighted grade in the class, the B would not dip my GPA below a 4.0). But all of that was about grades, not about being a reader. All these years later, I’m working on that part, being a reader. If I ask my students to become this, I need to show them my process too. A link to my goodreads page is in my email signature. I talk about the books I’m reading. 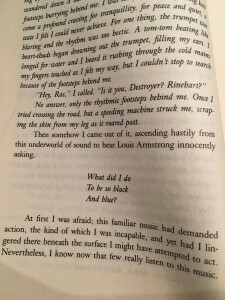 I talk about what I cut out (random internetting) to make space for reading. I talk about my goals as a reader and my struggles to get there. I started to become a reader again during those first few pages of Invisible Man. I was astounded at what Ellison was able to do with words. I didn’t know it was possible. I started to play with words myself–poetry, journaling, even my papers for my classes began to reflect more focus on craft. I don’t attribute this to the class I was taking at the time or the professor (though it WAS the professor’s syllabus that put the book in front of me). The class was a typical college literature class where students competed with each other to say the most interesting thing during discussion. 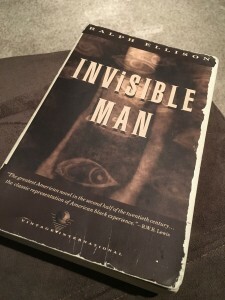 I give Ellison the credit for pulling me back into the world of reading and Invisible Man for grabbing me and not letting me go. I want my classroom to be a place that doesn’t shut down my students as readers. I do not blame my AP Literature teacher for my failures as a reader. I remember her fondly. In fact, I got in contact with her when I became an AP Literature teacher myself to ask her for resources. She’s a favorite teacher of my past. I used to love running into her on my college campus–she worked through a PhD in literature in the last years of her teaching career. But her classroom did not engage me as a reader. I needed space to make choices about what I read. I needed space to form my own ideas about the texts. I needed space that wasn’t dominated by a teacher’s interpretation. Sure, I learned a lot from watching my teachers form and support their interpretations of our texts. But I didn’t learn to be a reader. 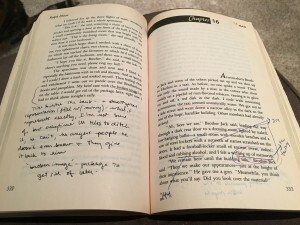 In my high school and college English classrooms, literature was a thing to conquer, to parse apart, to make an argument about, to be able to say the most interesting thing in the room about–not a thing I needed because I am a human being. We need literature because we are human beings. This entry was posted in literacy, reading, reflections, teaching literature, teaching reading, workshop teaching. Bookmark the permalink. Sarah, this is a stunning blog. One of my frustrations at NCTE was hearing conversations that were similar to what I heard when I was teaching in District 12. How far have we really come as a profession, I kept wondering, and the educational world felt bleak at moments. The only people I heard challenging status quo were some of the presenters, so as I read your blog and as I learn more about you as a teacher, I start getting hopeful again. Light begins to shine through the bleakness.